[COPPERHEADS]. Broadside, “A FREE PASS. 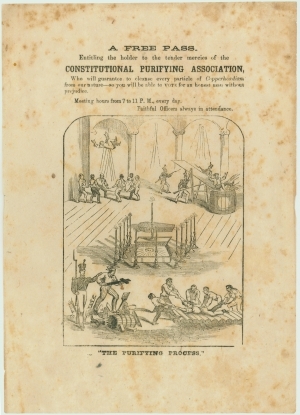 Entitling the holder to the tender mercies of the CONSTITUTIONAL PURIFYING ASSOCIATION, Who will guarantee to cleanse every particle of Copperheadism from our nature - so you will be able to VOTE for an honest man without prejudice...” with several illustrations depicting “THE PURIFYING PROCESS.” . 6 x 9 in.